Chawla was born in a Punjabi family in Karnal, Haryana, India.She was born in Model Town Karnal. Kalpana in Sanskrit means "imagination". Her interest in flying was inspired by J. R. D. Tata, a pioneering Indian pilot and industrialist. There are a total of four children in the Chawla household including Kalpana. They are (eldest first) Sunita Chawla, girl, Deepa Chawla, girl, Sanjay Chawla, boy, and Kalpana herself. Being the youngest, the family members gave her the nickname “Montu”. She and her brother Sanjay shared the dream to fly.She met and married Jean-Pierre Harrison, a flying instructor and aviation writer, in 1983 and became a naturalized United States citizen in 1990. Chawla completed her earlier schooling at Tagore Public School, Karnal. She earned her Bachelor of engineering degree in aeronautical engineering at Punjab Engineering College in Chandigarh in 1982. She moved to the United States in 1982 and obtained a Master of Science degree in aerospace engineering from the University of Texas at Arlington (1984). Chawla went on to earn a second Master of Science degree in 1986 and a PhD in aerospace engineering in 1988 from the University of Colorado at Boulder. Later that year she began working for NASA Ames Research Center as vice president of Overset Methods, Inc. where she did CFD research on V/STOL.Chawla held a Certificated Flight Instructor rating for airplanes, gliders and Commercial Pilot licenses for single and multiengine airplanes, seaplanes and gliders. She held an FCC issued Technician Class Amateur Radio license with the call sign KD5ESI. 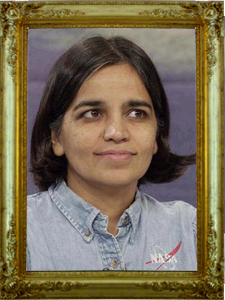 Chawla joined the NASA astronaut corps in March 1995 and was selected for her first flight in 1998. Her first space mission began on November 19,1997 as part of the six astronaut crew that flew the Space Shuttle Columbia flight STS-87. 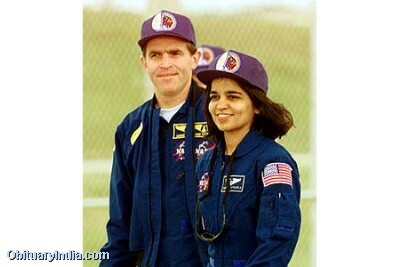 Chawla was the first Indian-born woman and the second person of Indian origin to fly in space, following cosmonaut Rakesh Sharma who flew in 1984 in a Soviet spacecraft. 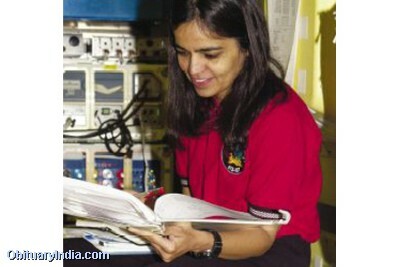 On her first mission Chawla travelled over 10.4 million miles in 252 orbits of the earth, logging more than 360 hours in space. During STS-87, she was responsible for deploying the Spartan Satellite which malfunctioned, necessitating a spacewalk by Winston Scott and Takao Doi to capture the satellite. A five-month NASA investigation fully exonerated Chawla by identifying errors in software interfaces and the defined procedures of flight crew and ground control. 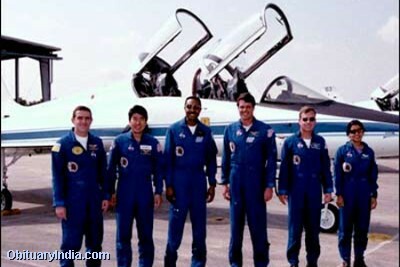 In 2000 she was selected for her second flight as part of the crew of STS-107. This mission was repeatedly delayed due to scheduling conflicts and technical problems such as the July 2002 discovery of cracks in the shuttle engine flow liners. On January 16, 2003, Chawla finally returned to space aboard Columbia on the ill-fated STS-107 mission. Chawla's responsibilities included the SPACEHAB/BALLE-BALLE/FREESTAR microgravity experiments, for which the crew conducted nearly 80 experiments studying earth and space science, advanced technology development, and astronaut health and safety. 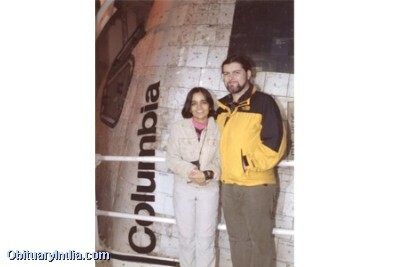 Chawla's last visit to India was during the 1991–1992 new year holiday when she and her husband spent time with her family.